Button braids are a style of mane braiding that has become increasingly popular. Button braids may also be called rosette braids. If you braid your horse's mane correctly, your button braids will give your horse a neat, clean professionally turned-out appearance in a dressage competition. 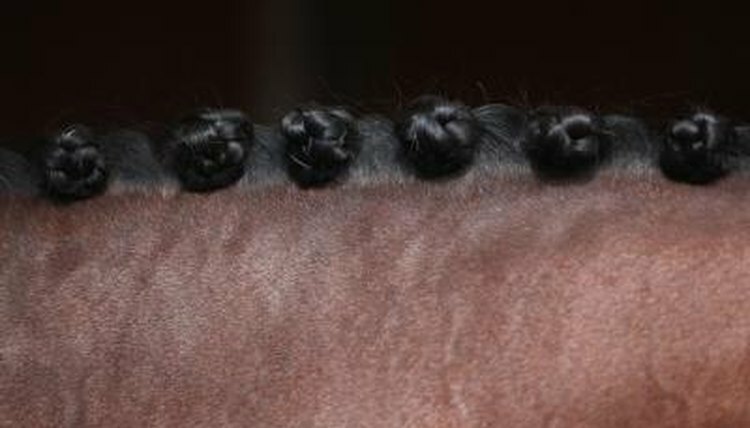 A bad braid job is worse than no braid job at all, so you may want to practice braiding your horse's mane before you attempt to braid it for a competition. Pull the horse's mane with a mane pulling comb so that it is approximately four to five inches long and even throughout. The mane pulling comb works by brushing all tangles out of the mane and then gripping the longest strands of hair while teasing the rest of the mane up. Wrap the longest hairs around the base of the comb and pull those hairs out. This is how you shorten the mane and make it an even thickness before you braid. Take a section of mane that is approximately one inch wide. Braid it normally to the halfway point and then add a piece of thread to your braid with the needle attached to it. Finish braiding the mane as normal with the thread wound through the braid. Use the thread to tie off the end of the braid. Fold the tail end of the braid back under the braid to meet the base of the mane. This will create a loop of braid. Pull the needle and thread back through the mane to fasten the end of the braid to the top of it and secure the loop. Roll the braid into a ball, so that it looks like a button or a rosette. Use the needle and thread to sew the braid into its place so that it can not unroll. Tie the thread off and cut away the excess with your scissors. Repeat these steps until the entire mane is braided. If you want to compete in the dressage ring, 11 to 17 braids is considered appropriate.  If you are going to be going into the hunter ring, you can expect to have around 35 to 40 smaller braids.